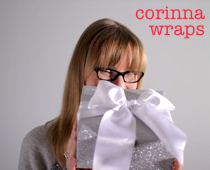 This post was first published in Corinna’s monthly Gift Wrapping Newsletter. Sign up here! The most common mistake people make when wrapping is measuring their paper wrong. Have too little and, well, you’ll have a hard time covering your box.